After a couple of leaks here and there, and some custom ROMs, Samsung finally explained how the 5.3-inch Galaxy Note will get updated to Android 4.0 Ice Cream Sandwich and what the mysterious Premium Suite coming along is. When you first hear the words, you might think Samsung is again referring to a collection of features instead of a full ICS update, but in actuality the Premium Suite is a collection of apps specific for the S Pen. Those include the S Note, an update of S Memo, and My Story. Samsung is now showing this in all the detail you might need in the video below. The S Note application for example is pretty vast and has shape recognition so your diagrams always look neat. You can also fit content in one of seven pre-defined types, which could be useful for some. And finally, you have My Story, which is a neat app for creating content-rich and funny e-cards, that you can then send to your loved ones. Check out what the Premium Suite is all about below - it should be out by the end of Q2 2012. It's getting better and better, I have gtab 7.7 but still I want this phone. Samsung keeps on innovating unlike others suing here and there..
How's battery life doing when comparing ICS with Gingerbread? galaxy note is much much better than galaxy s2.it so customizable.can do anything on phone.i will prefer galaxy note instead of galaxy s2 or upcoming s3.pls release the upgrade version of galaxy note. perfect all round phone! I'm still loving it i'm a person that has a new phone every 3 months but the note by fare beats them all in every aspect . I wish for a tablet interface like the one on the 7 inch galaxy tab 2 on this update. Totally agree with ivanko with the excellent signal reception. the note beat my previous SGS2 and O2X on this aspect. 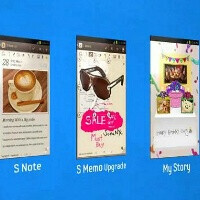 It seems hard to replace the note with any of the upcoming quad core. With SGS3 coming still I would keep my note or have then both if I like the SGS3. yes iv noticed a massive difference in reception ! my last 2 phones used to come up with *failed to send SMS* and drop calls now my note has not disappointed me once in anyway.